I am back to walking, trying to rebuild stamina after several weeks of staying off my foot due to ingrown toenail issues and the resulting correction by a podiatrist. Eek! Needles and scalpel! Actually I don’t know if he used a scalpel to remove the left side of the offending toenail. I was a big weenie. After seeing the needle action, I didn’t watch the rest. I just scrunched my eyes shut and did that Lamaze panting. It worked. Evidently it was a perfect toenail delivery. Anyway, with husband Walter off from driving the school bus for the summer, we are braving the heat and humidity and walking after dinner. Yesterday we paused on the other side of our circle for me to snap a closeup of one of the pink blooms on an oleander bush. As I struggled to maintain balance while keeping the camera steady, fat raindrops started plopping. I frantically stuffed my little Canon back in its case. A little rain wouldn’t hurt hubby or me, but I didn’t want to take a chance with the camera that I can use with one hand only. The precipitation was over in moments. In the few minutes that it took us to make it on around to our side of the circle, the only evidence of the brief event was a pattern of wet spots on the asphalt. 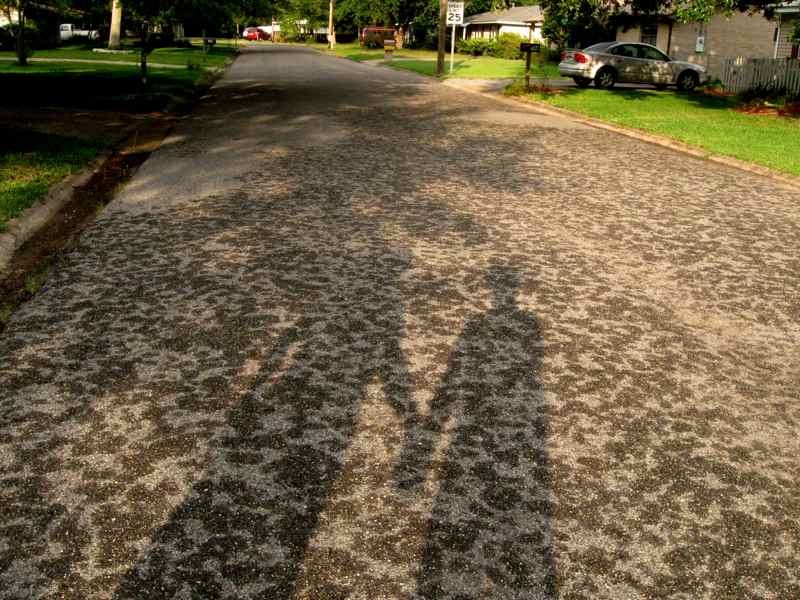 The shadows are hubby’s and mine. I love your description of the poor toenail surgery, OUCH!!!! Even after everything you've been through, that is not pleasant. And yet you never complained once on your blog! 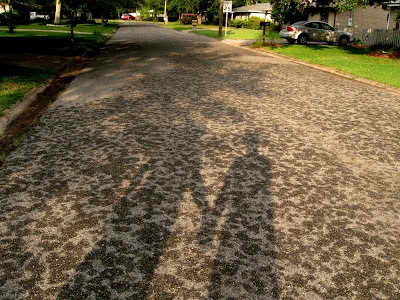 I love your shadows, I took one like that with Phil and me, but did not think to hold hands, drat!! 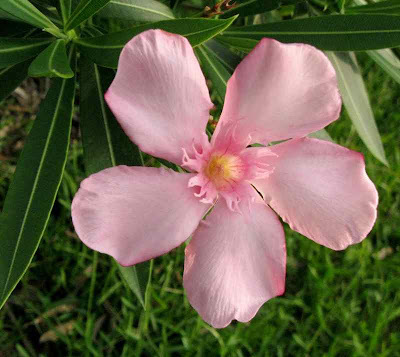 I just adore the oleander!!! I hear talk about them, they seem particularly southern, but I never saw one or knew what they looked like. It is BEAUTIFUL!!! What do they smell like? Beautiful pic of the pink blossom! Glad to hear that you are on the mend following your ingrown nail surgery - I'm sure you're feeling much better now it's been removed. I just love those hand holding shadows. Awesome picture. So glad your foot is healed enough that you can walk again.